Frighteningly real volunteers appeared to take their roles seriously as they prepared to scare the pants off of Millet residents at the Millet Legion's Annual Haunted House Event that took place on Friday and Saturday night October 26 & 27. 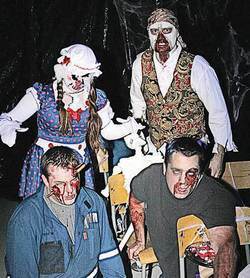 Clockwise from bottom left are "Injured Worker" Chase Wilk, "Evil Rag Doll" Kirsten Murphy, "Zipper Face" Brian Patrie, and bloody Shelby Wilk, who was the make up artist that transformed everyone into the horrors you see. The skeleton in the center of the photograph has still not been identified.